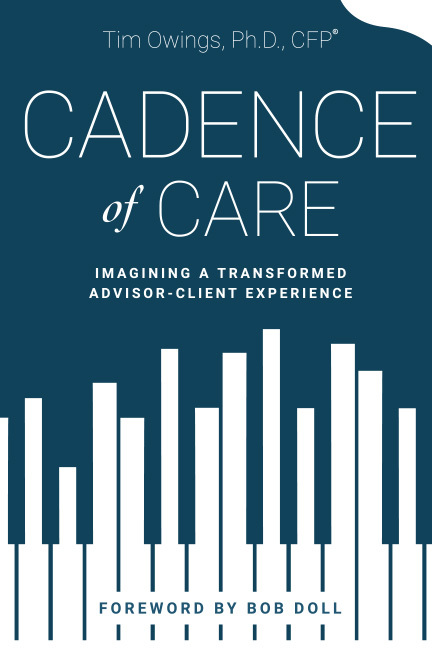 In Cadence of Care, Tim Owings illustrates a new model for client care mined from his 40 years as a beloved ordained minister. Using compelling stories from his dynamic background, Owings shows how an individual’s keen awareness of human behavior can create deeper, more meaningful interpersonal experiences. Professionals who integrate into their work the imaginative concepts depicted in this book will deepen relationships, find greater job satisfaction, and grow their business. When a person believes somebody gets it, they readily tell others. Put your finger on the pulse of each client’s need to be validated and discover an innovative way to transform your practice as well as your life. Subscribe to Tim’s website, www.timowings.com, where you will find supplemental material to enhance your advisory practice and information on how to schedule him for an event. Tim Owings is a financial advisor in Augusta, GA. He and his wife Kathie have been married more than 40 years and have three adult children and five grandchildren. A Paul Harris Fellow and active Rotarian, his interests include serving his clients, writing, teaching, creating and performing piano arrangements, travel, learning, and spending time with his family.